Your baby's teeth begin forming before the baby is even born! Even though you cannot see any baby teeth for the first 6 months, they are there waiting to erupt underneath the gums. Primary incisors (baby front teeth) - Usually your baby's front two bottom incisors will come in first around 6 months of age, followed by the top two incisors approximately 2 months later. You may find that your baby's teeth erupt in pairs. As soon as you see a tooth erupt, it is important to start brushing with a soft infant toothbrush. Primary lateral incisors - The lateral incisors, which are located directly next to the front incisors, come in next. You can expect your baby's lateral incisors to erupt around 9 months. Often, the top four teeth (central and lateral incisors) will erupt around the same time. Keep in mind, it is a good idea to schedule your baby's first by age 1. First set of primary molars - Next to come in are the first molars. Babies normally get molars in before their canines, leaving a temporary space between the front four teeth and the back teeth. The first molars erupt around 13 months. Primary canines - The canine teeth are used for tearing food and will help your baby to eat more textured foods. The canines general erupt around 16 months. 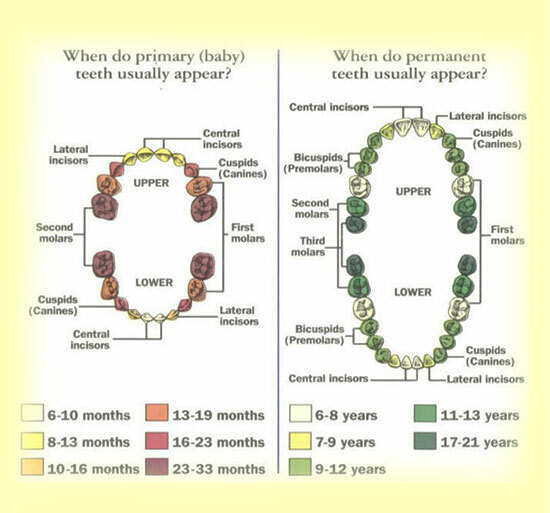 Second set of primary molars - The second set of molars are sometimes called the two year molars because they generally erupt around your baby's second birthday. First permanent molars - Your child's first adult teeth will erupt around the time he or she is 6 years old. At 6 years old, most children lack the hand skills to reach all the way to the back of the mouth to brush these important adult teeth. During this stage, it's important to help with night time brushing until age 8. When will my baby's teeth start falling out? Your child's teeth generally fall out in the same order that they erupted. You can expect your little one to lose his first tooth around his 6th birthday. Your child will continue to lose baby teeth until he is about 12 or 13. With permanent teeth moving into place, this is an excellent time to visit an orthodontist to discuss braces. Copyright © 2019 Pediatric Dentistry of Savannah. All Rights Reserved.